Whether you just drive your car to work and back or regularly road trip out of the O'Fallon area, the best way to ensure a safe and uneventful drive is to keep up with your auto service. But do you know your car maintenance schedule? Auffenberg Kia services all makes and models, from Mascoutah to Trenton and beyond, and we’re here to give you a general maintenance schedule for your vehicle — Kia or not. Oil helps keep your engine running all over Trenton, ensuring metal glides smoothly instead of grinding and causing damage. Running out of oil or running on bad oil can cause severe engine damage, and you should have your oil changed as often as your manual recommends — usually between 4,000 and 6,000 miles. Modern car batteries don’t require any regular maintenance, but they will eventually die. 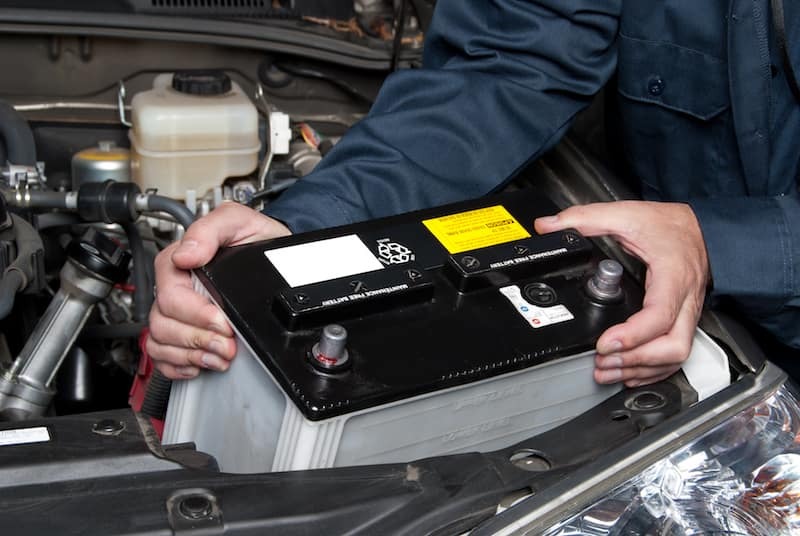 If you’re lucky enough to not worry about any cold snaps, a car battery can last as long as 5 years. Once you hit that mark, we often recommend a new battery just so you’re not caught with a dead one unexpectedly. It’s also good to check for damage or signs of wear (like leaking or corrosion around the poles). There is no set mileage for most windshield wipers, but you should replace them as soon as you notice them failing. Once you turn those wipers to “on” and see that you’re only clearing some of the water off of your windshield, it’s time for some new ones. If your vehicle has spent the winter months in a particularly cold climate, the damage to the rubber could be significant, and we recommend inspecting windshield wipers as part of spring auto maintenance. Engines, like people, need air to function. The modern car is designed to operate with air flowing into the engine bay, and if the filter is obstructed, it can affect vehicle performance and mpg. We recommend changing your air filter as often as you have your oil changed, just so you don’t put it off for too long — so that’s every 4,000 to 6,000 miles. When you buy new tires, they have a mileage limit on them, and it can range from 40,000 miles all the way up to 80,000 miles or more. You’ll only reach that mileage if you regularly rotate your tires for even wear, every 5,000 miles or so. It’s wise to regularly inspect your tires for signs of wear and tear as well as uneven wear, as those can be indicators of bigger problems. If your Kia model is in need of repair or inspection in the O'Fallon area, you can do it yourself, or you can kick your feet up as the experts at Auffenberg Kia handle things. We have a talented team of professionals who can service your vehicle in the best possible way, and we always use genuine parts to keep your Kia running properly. Schedule your appointment today. Want a specific schedule? We have detailed car maintenance schedules for your vehicle. Tire Sale Buy 3 Tires Get 1 Free! *See Dealer for complete details. Offer expires 04/30/2019. Disclaimer: Scrath & Save offer not valid on this coupon. Most vehicles. May not be cominine with any other offers or specials. Must present coupon when order is written. Plus tax & supplies. Valid only at this dealership. Expires. 6-30-19. FREE Rotations & flat repair with the purchase of 4 tires. Also included is a 1 year 12k Mile Road Hazard warranty. Receive 15% Off Kia Accessories! Valid only on factory accessories. Please present at time of write-up. Must be used on parts counter slip. Not valid with any other coupons or specials. Coupon has no cash value. Auffenberg Kia is the place to save for Kia parts and accessories. Save on wiper blades, only $17 plus tax! See dealer for complete details. Offer expires 7/31/19. Auffenberg Kia is the place to save on Kia parts and accessories. Save 10% off batteries when you get them installed by Auffenberg Kia! See dealer for complete details. Battery must be installed at Auffenberg Kia. Offer expires 07/31/2019. As a Thank You for your service: we’d like to offer you 10% off of service and parts at any one of our dealerships. Maximum $100 discount. Cannot be combined with any other offer. Service and parts only. Not valid for vehicle sales.